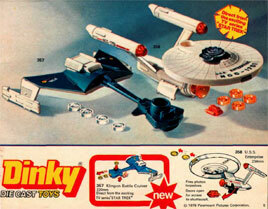 A vintage ad for Dinky’s die-cast Star Trek toys. 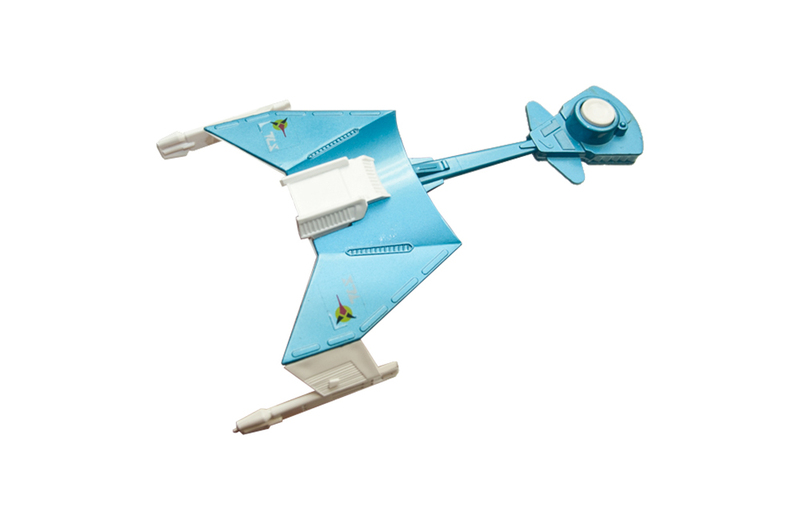 To complement the earlier release of its die-cast USS Enterprise (NCC-1701), in 1977 Dinky Toys released a replica Klingon D-7 Class Battle Cruiser. The ship first appeared as part of The Original Series in 1968, and it (or subsequent variations) has remained part of the Star Trek universe ever since. The ship was equipped with same weapons system as Dinky’s Enterprise – a rapid-fire “torpedo” defense system was integrated into the toy’s die-cast metal body. Seven white firing discs were included and loaded into the top of the ship and fired out the front. A series of decals were also provided to make the toy appear even more menacing. The history of the Dinky Toys brand dates to 1934, when British company Meccano began producing lines of small-scale, die-cast automobile and truck models. Competition from Mattel’s Hot Wheels line in the late 1960s forced the company to diversify its offerings. Before declaring bankruptcy in 1979, Dinky Toys released 20+ die-cast vehicles that were licensed from current television series of the day, including Star Trek and Space: 1999. Released in 1964 by Ideal, Hands Down was a high-energy game that encouraged 3-4 active participants to get "slap happy." Released in 1976 by Mego, the Star Trek Super Phaser II Target Game was a projectile-free target game long before Laser Tag hit the scene in the mid-1980s.